2014 BMW 4 Series Convertible revealed | What Car? This is the BMW 4 Series Convertible, which has been revealed in official pictures before its debut at the Los Angeles motor show in November. There will be three engines at launch: a 181bhp diesel 420d, a 242bhp petrol 428i, and the 302bhp petrol 435i. The 4 Series Convertible is available with either a six-speed manual or eight-speed automatic gearbox. All versions are fitted with stop-start technology. The diesel has CO2 emissions of 127g/km and official fuel consumption of 58.9mpg. At the other end of the performance spectrum, the 435i with the auto ‘box claims a 0-62mph time of 5.5 seconds. The 4 Series Convertible retains a folding hard-top roof rather than a fabric hood. BMW says it has reduced the amount of wind and road noise entering the cabin to make it quieter inside. The roof can be lowered at up to 8mph. When the top is down and the tailgate is opened, the folded roof pivots upwards in the boot to allow easier access for loading and unloading. There’s a 370-litre boot with the roof up, although that shrinks to 220 litres with the roof folded. Five trims are available: SE, Sport Line, Modern Line, Luxury Line and M Sport. The 4 Series Convertible is better equipped than the outgoing 3 Series drop-top - even the basic SE trim gets xenon headlights, front and rear parking sensors and leather upholstery. Sport Line specification adds black gloss finishes to the exterior, including the slats in the twin-kidney grille and air intakes within the front bumper. The cabin gets a sprinkling of red trim accents and stitching on the wheel. Modern Line cars have matt chrome and satin aluminium accents. There’s a greater choice of interior colour combinations, and two-tone door panels are also available. Luxury Line cars have a chrome finish to the exterior trim and tailpipes, while 18-inch alloys and the Business Media Package are also standard. The M Sport package is expected to be popular. The bodykit includes deeper front and rear bumpers as well as side skirts, with either 18-inch or optional 19-inch alloy wheels. Standard equipment includes sports seats, the Business Media Package and M Sport suspension and brakes. 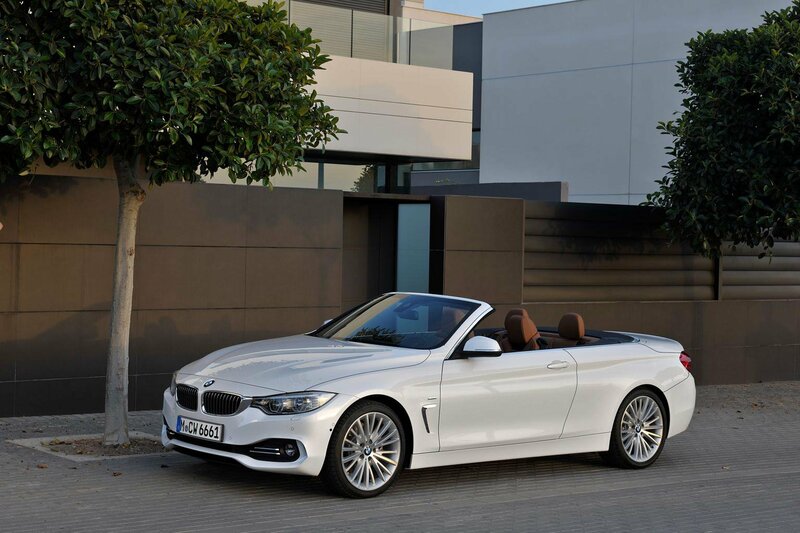 The BMW 4 Series Convertible goes on sale on March 8, 2014, with prices starting at £36,675 for the 420d SE.